Plant food is a factor so far slightly neglected in research about Göbekli Tepe. We are now aiming to close this gap [read more here and here]. Preliminary results on grinding equipment from Göbekli Tepe and experimental approaches will be presented at this year´s Awrana (Association of Archaeological Wear and Residue Analysts, external link) conference at University of Nice Côte d’Azur on May 31, in a collaborative paper by Laura Dietrich, Oliver Dietrich, Julia Heeb and Nils Schäkel. During the 10th and 9th millennia BC, at Göbekli Tepe in southeastern Anatolia, hunter-gatherers constructed the first monumental architecture of mankind. In an older phase, circular enclosures made up of up to 5.5m high pillars decorated richly, mainly with animal motifs, were erected, while in a younger phase rectangular buildings with smaller pillars were in use. Important questions regarding this site concern the way in which small-scale groups joined their forces for the massive construction work, creating a place strongly connected to their worldview, and how they secured their subsistence during the prolonged work at the site. Until now, the focus was on the numerous finds of animal bones and hunting as subsistence strategy. This image may be biased by bad preservation conditions for plant remains, as more than 10.000 grinding stone were discovered at the site, reaching from flat slabs over deep bowls to mortars, pestles and handstones. At least in the younger phase of the site, a number of the square rooms could be interpreted as storage facilities, as they also contain large limestone vessels with capacities of up to 200 liters. 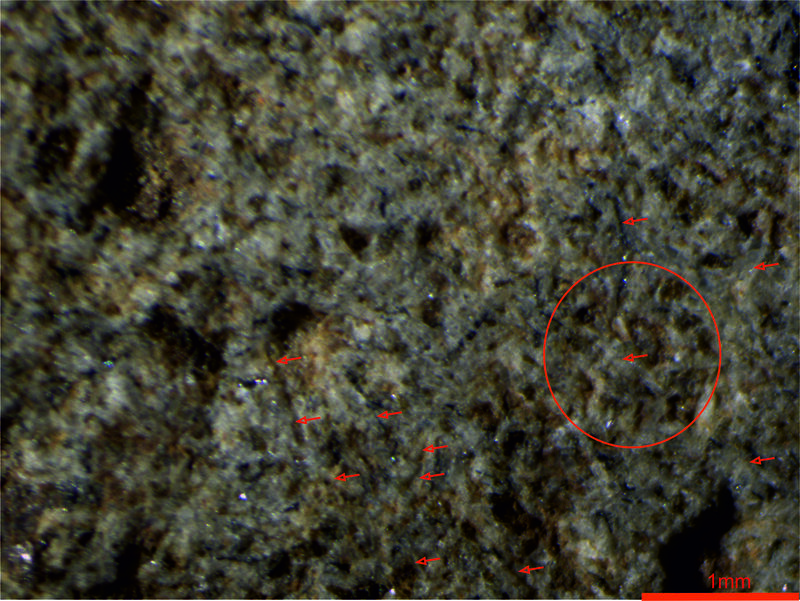 Macroscopic and microscopic use wear hint at the use of the grinding stones for massive plant food processing. This interpretation is based on a comparison with experimentally manufactured objects. During the experiments, use-wear was related to shapes and to the grinding motions as important analytical parameters. The paper aims to reveal the role of plant food at Göbekli Tepe, and linked with this, economic and social factors related to the construction and maintenance of this important site. 4: Handstone in 3D with analysis of roughness (model H. Höhler-Brockmann, copyright DAI). 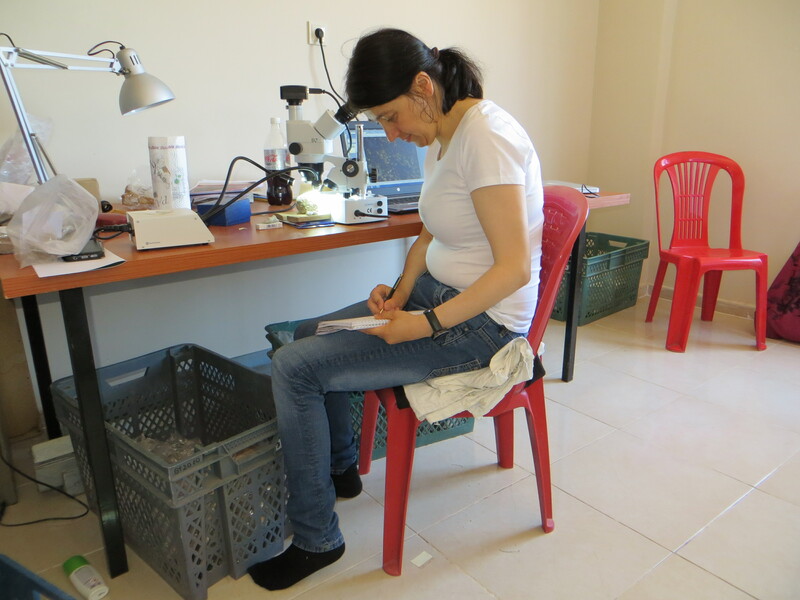 The reason I haven’t posted so much in the last months was because the start of the project „Plant Food Management at Early Neolithic Göbekli Tepe“ was requesting a lot of preparations, which left me with few time for blog contributions (I’m tweeting my research step by step, though, under: @laura_dtrich). The main aims of my research project is to reconstruct the use of plants in the food spectrum at Göbekli Tepe, the plant management strategies and the interaction between man and environment on one side, and to contribute to an explanation for the special character of the site through new insights from this point of view on the other side. The study of plant resources and plant food at Göbekli Tepe is of great importance to understand Early Neolithic subsistence in the Levant and, linked to this, economic, social and biological processes that shaped our modern world. The site covers a long time span, in which the Neolithisation, i.e. the domestication of plants and animals, took place, until a point of no return to the world of hunters and gatherers was reached. Göbekli Tepe is a special site, most probably a central site for meetings, and a cultic place with monumental architecture. It is not likely, at the current state of research, to interpret the site as a settlement (at least not as a “classic” settlement with populations living permanently at the site). But the more or less permanent presence of groups of people, erecting monumental architecture and/or maintaining it has to be assumed, and their subsistence was most likely an important issue. Also, social events like feasting could have played an important role at the site (Dietrich et al. 2012: O. Dietrich, M. Heun, J. Notroff, K. Schmidt, M. Zarnkow, The role of cult and feasting in the emergence of Neolithic communities. New evidence from Göbekli Tepe, south-eastern Turkey. Antiquity 86, 2012, 674-695). 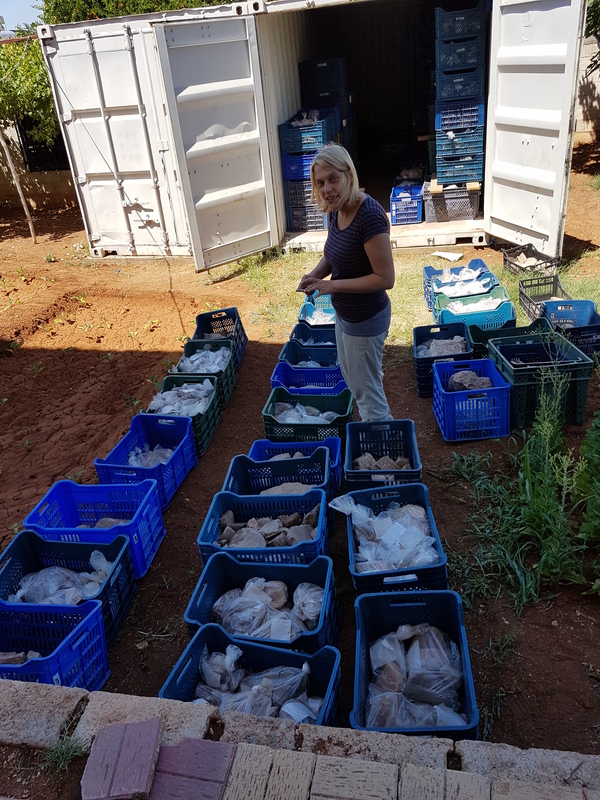 Plants seem to be a more stable food resource compared to the partly migratory hunted animals, and the presence of an impressive quantity of storage vessels is certainly a hint for the massive storage of plant food at Göbekli Tepe. Different approaches for a reconstruction environments and plant use exist, for example through pollen and phytolith analysis. These methods can be theoretically used, but still have some methodological problems to be solved. The reconstruction of plant food is largely based on the botanical analysis of the plants discovered at a site (in significant contexts). 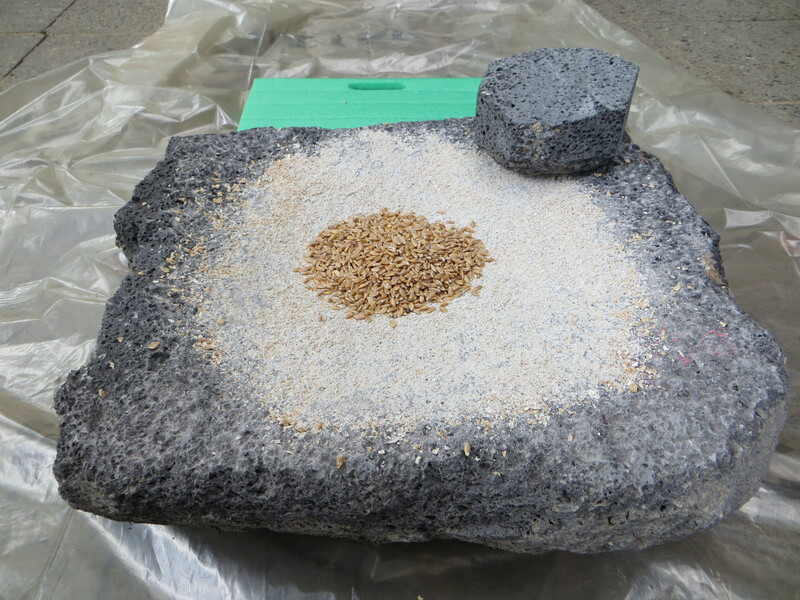 But objects like grinding stones can make a significant contribution to our knowledge on plant use. 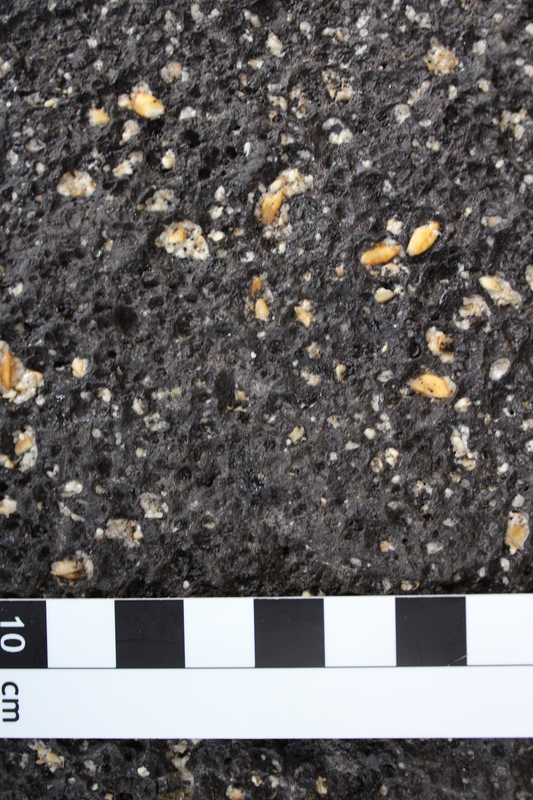 Macrobotanical analysis has shown the use of einkorn, emmer, barley, pistachio and almonds at Göbekli Tepe (Neef 2003: R. Neef, Overlooking the Steppe-Forest: A Preliminary Report on the Botanical Remains from Early Neolithic Göbekli Tepe (Southeastern Turkey). Neolithics 2, 2003, 13-16). However, there are only very few plant remains from Göbekli Tepe, and they are also badly preserved. The bad preservation conditions for such remains will inevitably lead to a very biased image regarding plant food at the site. 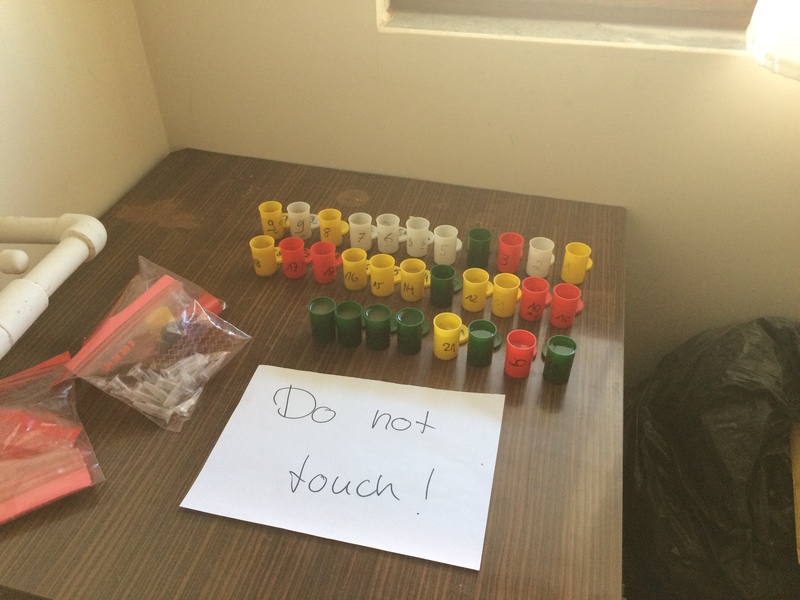 Given this situation, objects for the preparation and storage of food are a much more objective method to quantify the actual use of plant resources. There are over 10.000 grinding stones from the site. It is known from ethnographically sources that grinding stones were used for processing numerous foodstuffs (cereals, nuts, legumes, herbs, even meat, cheese or grasshoppers) but also minerals (salt, ochre), sugar and even animal skins. The processing of meat, ochre and animal skins was observed in several Epipalaeolithic sites in the Levant (Dubreuil et al 2015: L. Dubreuil, D. Savage, S. Delgado, H. Plisson, B. Stephenson, I de la Torre, Use-wear analysis of ground stone tools: discussing our current framework, in J. Marreiros, J. Bicho (Eds.) Use-wear handbook 105–158. Berlin, Springer 2015). One of the main aims of analyzing grinding stones is to deduce exactly their functions, and that can be done by analyzing their surface with the microscope for usewear; 3 D models are also useful tools for quantifications of use. Grinding different materials will produce different wear on the surface. The specific patterns of usewear traces can be compared with experimental objects (blog contribution coming up), used for grinding just one material. This is one of the best and most exact ways to deduce the function of grindings stones and, through statistically and stratigraphically secured observations, the amount of plant food in daily life. 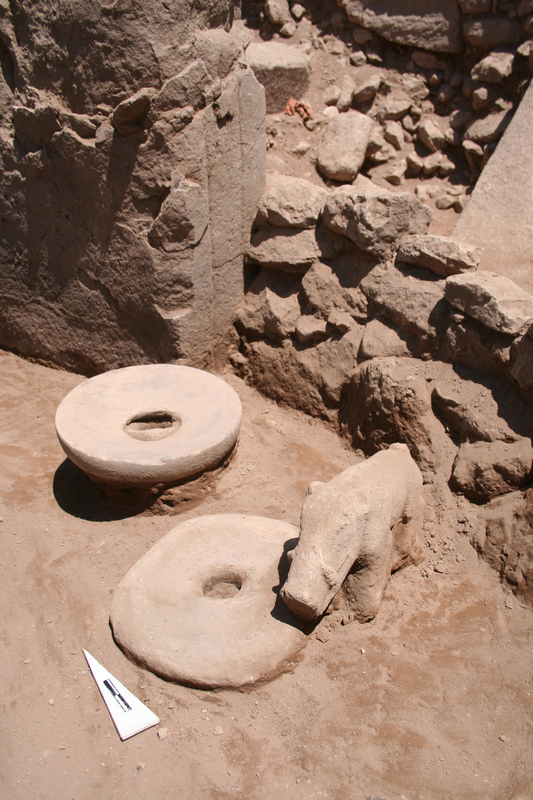 According to (very) preliminary results, numerous grindings stones were used at Göbekli Tepe for the processing of cereals and nuts, and very few for ochre and animal skins. 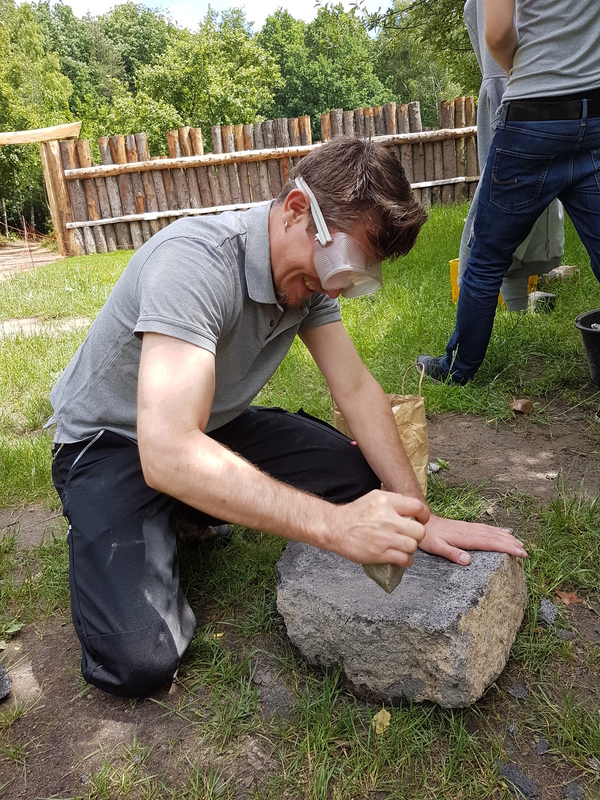 But a lot of work will follow to put these observations on a statistically firm basis, and – given the huge amount of information and different methods of analysis – it takes definitely more than one scientist to make (10000) stones speak! So here is my hive mind, which made my research possible this year: Hajo Höhler-Brockmann (German Archaeological Institute), Julia Meister (Free University of Berlin), Julia Heeb (Village Museum Düppel) and Nils Schäkel (Free University of Berlin) and of course Oliver. 3: Analyzing the use wear with the microscope, making 3D-models and taking samples from the surface: me (left), Julia (right), Hajo (behind). 4: Handstone in 3D (model H. Höhler-Brockmann, copyright DAI). 4b: …and Hajo taking photos (photo J. Meister). 6: …and me analyzing it (photo J. Meister). 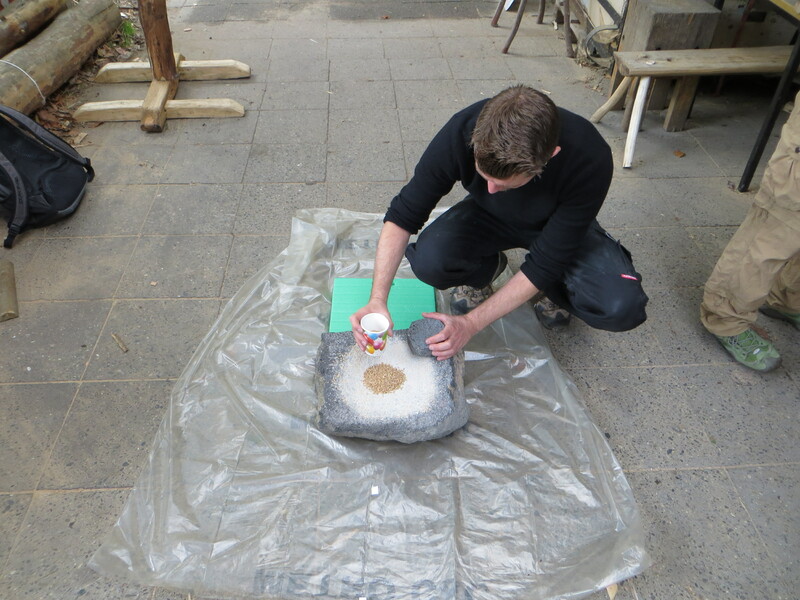 10: …and starting to study use-wear again (photo B. Kortmann)! 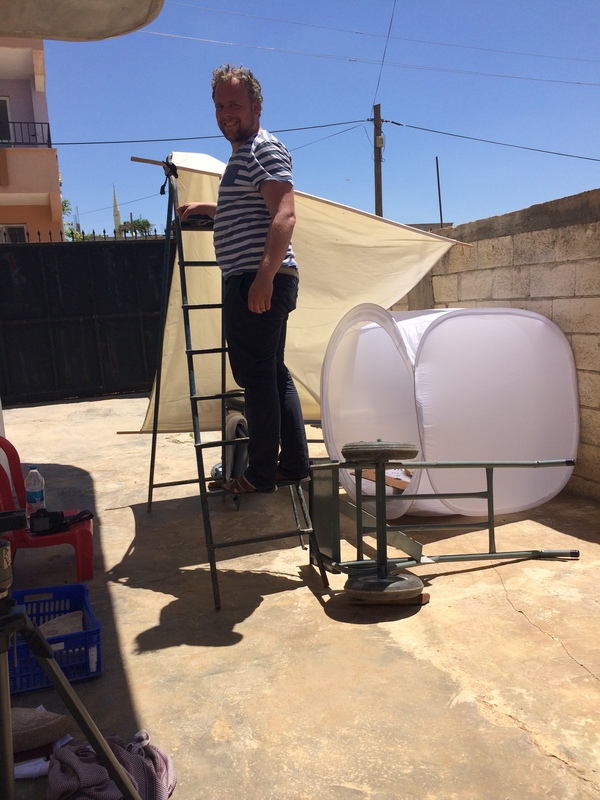 And finally: preparing first papers…which is the most exciting part of research! 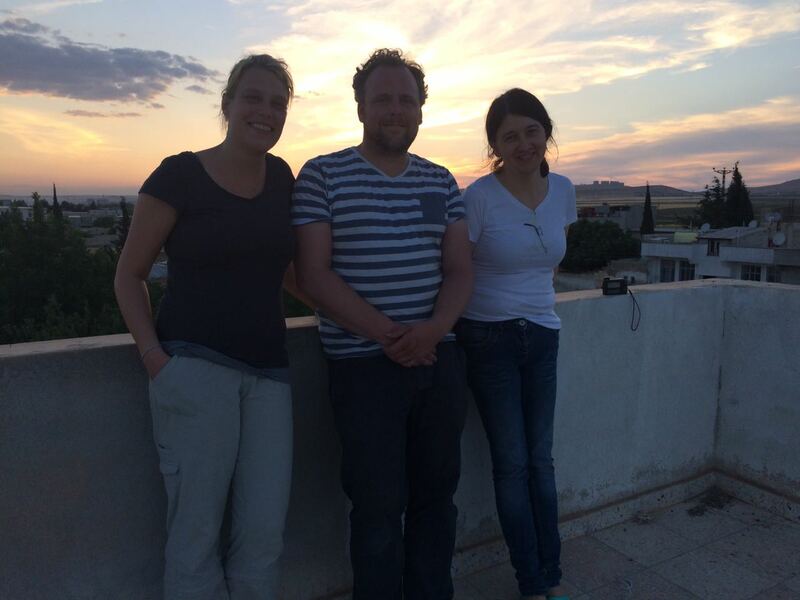 This short post is meant to introduce myself, Laura, as a new member of the Göbekli Tepe project team. 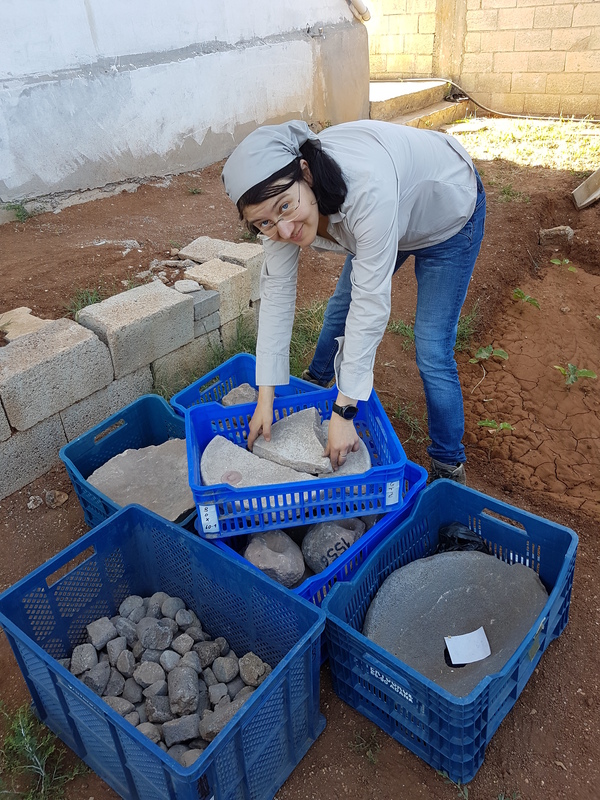 I am an archaeologist doing research into the Neolithic and Bronze Age from the Levant to the Carpathian Basin with a focus on the archaeology of food and conflict. Exploring the preparation of vegetable meals in Göbekli Tepe and inferring the social dimensions of vegetable food is part of my project during the next three years. Göbekli Tepe has a big potential for such studies. Not only is there a vast material culture related to food processing (grinding stones, pestles, mortars, sickles etc. ), but food, and also vegetable food, seems to have had a special place in the worldview of its builders. Here is a little teaser. In 2008, during the excavation of the final layers of Enclosure C, a special discovery was made. A wild boar and two stone platters lie in front of one of the central pillars of Enclosure C. The sculpture is around 30 cm high; its length is almost 50 cm. Both platters are similarly large, with diameters of 47 and 50 cm. They have been intentionally perforated in the middle; other similar finds from the site are usually unperforated. Strike marks are obvious around the perforation. Their surface is very well smoothed, although the northern platter is better worked than the southern one. Both platters are round with slightly convex surfaces down to the perforation. The wild boar is sitting with his mouth on the platters, somehow slightly oblique, its neck oriented to the hole.The platters don’t sit directly on the ground, but suprapose other stone vessels. Several more wild boar sculptures and reliefs are known from Enclosure C. All of them are part of one bigger ensemble surrounding the central pillars – and this ensemble clearly shows strong links to the preparation of food. We are only at the start of deciphering the multiple layers of meaning inherent in the buildings of Göbekli Tepe. So stay tuned for more as I start as we begin to unveil the site’s secrets.